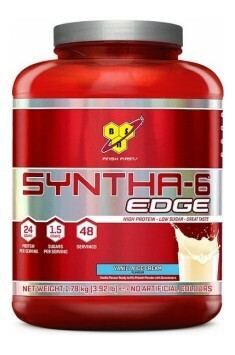 Syntha-6 is among one of the most recognised and used protein powders on the market. There is a good reason for that, as it is a blend of high quality proteins with an amazing flavour. Very few products come close to how good Syntha-6 tastes and those of you who have tried it, know what we are talking about. The improved version Edge provides you with 48 servings, each packed with 24g of protein with only 1.5g of sugars. This makes it the perfect protein powder that can be used at any time of the day. Depending on the protein needs, consume 1-3 portions a day. The supplement should be administered according to individual protein needs. A person that wants to increase muscle mass should provide the body with more protein. It can be assumed that the daily amount of protein in an athletes diet as well as for active people should be in the range of 1.5 to 2.2 g / kg body weight. If this does not cover your needs for this dietary component, you should drink them in form of protein shakes in the amount corresponding to the shortcomings. Consume a portion of the morning, just after a workout and before bedtime. Correct supplementation will have a significant effect on the speed of the results achieved. Protein blend (whey protein concentrate, whey protein isolate, whey protein hydroisolate, calcium caseinate, micellar casein, , emulgator: soy lecithin), sunflower oil powder, flavors, thickeners (celullose gum, xanthan gum, carrageenan), color (beet powder), acidity regulators (citric acid), sweeteners (sucralose, acesulfame K).